Lately, I've been on the Italian bandwagon--tasting through oodles of Italian and Italian-inspired wines for a spot in Arlington, Virginia. Italy has over 800 different grape varietals--enough to make your head spin. Only 350 of those varietals are "authorized" by the Italian government to be used in fine wine production. Wine from Italy goes far beyond everyday Chiantis and Pinot Grigios with interesting wines like Nero d'Avola, Refosco, Trebbiano d'Abruzzo, and Vermentino. Below is a laundry list of interesting gems worth seeking out that were tasted during my foray into the world of Vino Italiano. 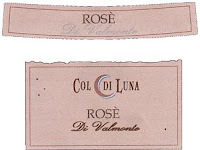 NV Bellenda di Valmonte 'Col di Luna' Sparkling Rosé, Veneto, Italy--blend of Raboso and Pinot Noir, fresh and juicy, notes of raspberry, strawberry, slight bit of residual sugar, refreshing. 2006 Bigi Est! Est!! Est!!! di Montefiascone, Umbria, Italy--blend of Procanico, Malvasia Bianca, and Rosciola, fresh and crisp, green apple and citrus fruit notes, touch of lemon, great for a hot summer day. 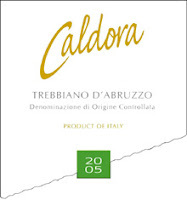 2005 Caldora Trebbiano d'Abruzzo, Abruzzo, Italy--made from the Trebbiano grape with floral and honey notes, ripe tropical fruit (mango, peach, passion fruit), rich and luscious. 2006 Alois Lagader Pinot Bianco, Alto Adige, Italy--herbal and citrus notes, clean, crisp, refreshing, good alternative to Pinot Grigio. 2005 Elena Walch Sauvignon Blanc, Alto Adige, Italy--mineral and herbal notes, almost chalky, hint of cat pee and citrus flavors, crisp with lingering finish. 2006 La Cappuccina Soave, Veneto, Italy--made from the Garganega grape, bright and crisp, lemon/lime flavors with a touch of ruby red grapefruit, crisp and mouthwatering finish. 2005 Talia Bianco, Sicily, Italy--blend of native Sicilian grapes (Catarratto and Grecanico), notes of honey and almond, ripe peach and mongo fruit, luscious and rich, good alternative to Chardonnay. 2006 Uvaggio Vermentino, Lodi, California--a real find--over the top herbal aromas, stonefruit, melon and kiwi flavors, a whiff of spearmint, crisp and refreshing. You will BEG for another glass. 2006 Cantina Nalles Gewurztraminer, Alto Adige, Italy--the grape of German and Alsatian fame finds itself at home in Nothern Italy, perfumed aromas of rose petal and lychee, touch of peach fruit and spice, medium to full bodied. 2005 Villa Arianna Frascati Superiore, Lazio, Italy--one of the better Frascatis I've found--too many are uninteresting and acidic, mango, guava and pear notes, medium acidity, smooth and voluptuous, medium bodied. 2006 Terrazzo 'Esino Bianco', Marches, Italy--blend of Verdicchio and Trebbiano, bright and crisp, pear, mango and peach notes, crisp and refreshing, lingering finish, light/medium bodied. 2006 Tenuta Maggiore 'Sentito' Cortese, Lombardy, Italy--85% Cortese and 15% Riesling, fresh with aromas of mango, apricot and honeysuckle, slight almond notes, medium bodied. 2005 Poggiobello Tocai Friulano, Friuli, Italy--very floral with melon and kiwi fruit, slight zing on the finish, medium bodied. 2005 Lupi Vermentino, Riviera di Ponente, Liguria, Italy--intense petrol aromas, citrus fruit and mineral notes, clean finish, medium bodied. 2004 Anime Refosco, Friuli, Italy--made from the refosco grape, bright and juicy cherry and plum notes, kinda grapey, light and easy drinking, would be tasty slightly chilled. 2004 Avignonesi Rosso di Toscana, Tuscany, Italy--red blend of Prugnolo Gentile, Cab Sauv and Merlot, aromas of plum, black currant and spice, undertones of wet earth, smooth and velvety tannins, medium bodied. 2004 Silvio Grasso Barbera d'Alba, Piedmont, Italy--plum and leather notes, with a touch of leather, smooth and velvety tannins, medium bodied. NV Mondo del Vino 'Tre Uve', Emilia-Romagna, Italy--blend of Sangiovese, Primitivo, Montepulciano, notes of black currant, pencil shavings and cedar, smooth and rich, slight chocolate undertones, medium bodied. 2003 Vecchia Torre Salice Salice Salentino, Puglia, Italy--made from the Negroamaro grape, ripe cherry notes with cedar and chocolate, smooth, fresh finish, medium bodied. 2003 Vincenzo da Filicaja 'Villa da Filicaja' Chianti Superiore, Tuscany, Italy--primarily Sangiovese, big and ripe, with sour cherry, gun powder, slight chocolate notes, smooth and silky tannins, medium bodied. 2002 Luigi Ferrando Carema, Piedmont, Italy--made from the Nebbiolo grape this is a much more approachable style than most Barolo or Barbaresco wines, black cherry, spice and leather notes, smooth and fresh, medium tannins, medium bodied. 2005 Podere Il Caio, Umbria, Italy--blend of Sangiovese, Merlot, Cabernet Sauv, brooding aromas of spice, cigar box, and leather, plum and blackberry fruit, velvety tannins, medium/full bodied. 2004 Feudi di San Marzano 'Sud' Malvasia Nera, Puglia, Italy--a real showstopper, juicy plum and bluberry notes, understones of leather and earth, rich and robust, silky tannins, medium bodied. 2001 Malgra Monferrato, Piedmont, Italy--blend of Barbera and Cabernet Sauv, bright black cherry and plum fruit, hint of spice, undertones of leather and earth, silky tannins, medium bodied. 2002 Pettrone Sangiovese, Mendocino, California--small production, bright and juicy black cherry, spicy vanilla notes, smooth and silky tannins, medium bodied. 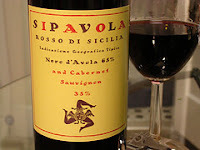 2006 Spiavola Rosso di Sicilia, Sicily, Italy--blend of Nero d'Avola and Cabernet Sauv, ripe plum and blackberry notes, velvety tannins, smooth finish, medium/full bodied. 2006 Sfida Puglia Rosso, Puglia, Italy--blend of Primitivo and Negroamaro, ripe and jammy wild berry notes, touch of spice, silky tannins, medium bodied. 2004 Casata Monfort Pinot Nero, Trentino, Italy--its been hard to find a decent Pinot Noir from Italy, but this one shows well--aromas of dried cherries, sweet tobacco and wet leaf notes, smooth and silky, light/medium bodied. 2000 Fratelli Gozzi 'Rosso Saline', Lombardy, Italy--supple and elegant blend of Cabernet Sauv and Merlot, dried red fruit notes, cedar and cigar box, touch of leather, very complex with silky tannins, medium/full bodied. 2004 Casata Monfort Teroldego Rotaliano, Trentino, Italy--made from the Teroldego grape, foxy and wild with leather and blueberry notes, savory and smooth, medium bodied. My favorite Italian varietals of late have been Negroamaro [from Puglia], and Vermentino from Liguria. Never thought I'd be looking to Italy for value.